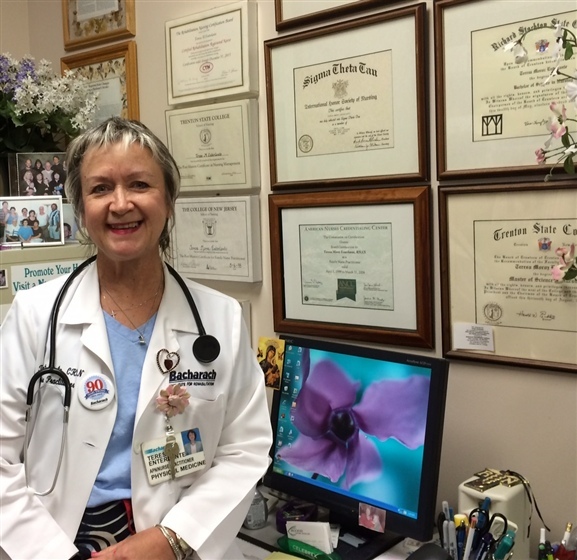 Tess Enterlante (pictured above) is an advanced practice nurse (APN) and has been working at Bacharach since 1979. Tess started her career as a licensed practical nurse (LPN) and went on to receive a registered nursing degree (RN) from Atlantic County Community College. Next, she received a Bachelor of Science in Nursing (BSN) from Richard Stockton College and earned a certification in rehab (CRRN) from the Association of Rehabilitation Nursing in 1985. Her initial master’s degree in nursing was in administration (MSN) for a clinical nurse specialist (CNS) from Trenton State College. Tess did not stop there – she continued her nursing education, earning a post-master’s certificate as a family nurse practitioner (FNP) from The College of New Jersey (formerly Trenton State College). She received her FNP certification in 1999 from the American Nursing Credentialing Center. Tess works as a nurse practitioner specializing in family rehab medicine. She goes on rounds with the doctors, obtains patient medical histories, and diagnoses, treats and evaluates patients. In addition, she conducts physical exams, admits patients and orders the necessary physical, occupational or rehabilitation treatments, diagnostic studies and medications for these patients.